The foundation run a variety of weekly courses for all ages and abilities and offer half term fun days and 4 day courses for children and young people at their venues in Cramlington, Ponteland, Newcastle and Consett. They still have places available for February half term and at only £10 per day, are very good value. I know I would much prefer my kids to be working on their skills, learning fairness and how to play as a team as well as getting some much needed fresh air with their friends rather than sitting at home and watching tv/playing on their computer. 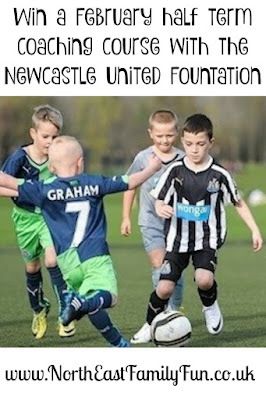 The Newcastle United Foundation provides lots of information for parents on their website which details everything from child to coach ratio, safeguarding and what you need to bring which certainly puts my mind at ease. 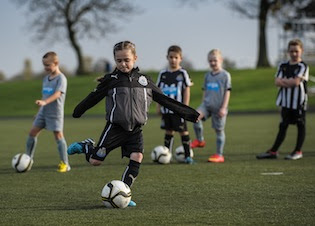 The Newcastle United Foundation have kindly provided us with a complimentary half term coaching course worth up to £40 from the 4 mentioned above to giveaway to one lucky reader. Simply enter via the rafflecopter giveaway below. Terms and Conditions:- Prize is for one place on a Newcastle United Foundation February Half Term Couching Course from a choice of Cramlington Learning Village, Ponteland Middle School or Goals Newcastle for one child (please check age requirements of course) subject to availibilty. No cash alternative and prize is non-transferable. Travel is not included. Competition closes at midnight on January 31st 2016. A winner will be randomly selected and notified via email within 48 hours of the competition closing and will have 72 hours to respond before another winner is selected.